In a large bowl, combine the first seven ingredients. Crumble the turkey over the mixture and mix well. Divide and shape into nine patties. 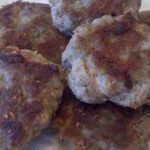 In a large nonstick skillet coated with cooking spray, cook patties over medium heat for 5 minutes on each side or until meat is no longer pink. Transfer to a paper towel-lined plate and serve.